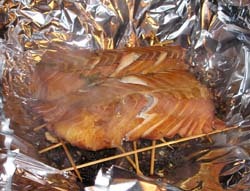 Elsewhere on Coquinaria is the recipe for hot-smoked salmon. 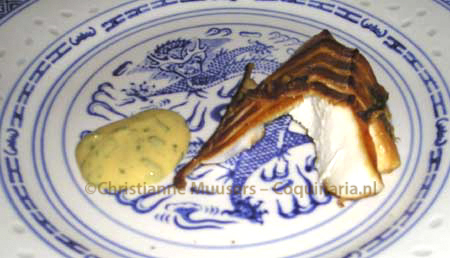 Here is another recipe for hot-smoked fish, but this time from China. 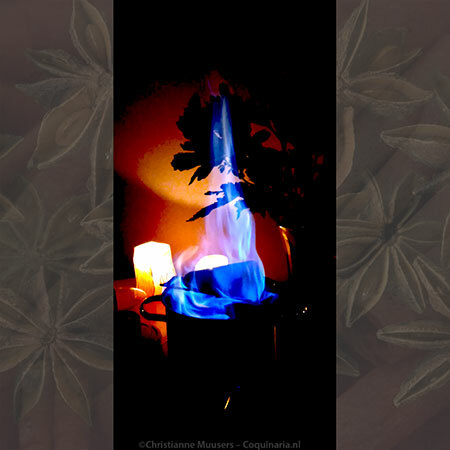 The fifference with ‘Western’ smoking is the smoke-medium: not woodchips or sawdust, but tea leaves with rice, sugar and spices. The fish is not cured but marinated and steamed before smoking. When you smoke fish with white flesh, like this cod, the contrast between the deep red surface and the white flesh underneath is beautiful. 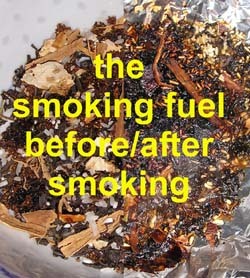 How to smoke in a smoker or ordinary pan is described on another page. because this is a Chinese recipe, I used a wok for smoking. Do not use a good stir-fry wok for this, but rather an old one that is not good for frying anymore. Smoking in a wok may seem a lot of work, but actually it is not difficult. Just try it. First course or main course for 4 persons; vpreparation in advance 5 minutes + 1 hour to marinate the fish + 6 minutes to steam the fish; preparation 20 minute. 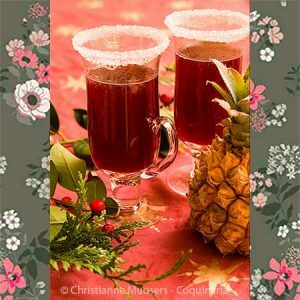 Use 50 gr (2 ounces) per person in a large menu, 150 gr (6 ounces) as a main dish. Mix everything for the brine and rub the fish with it. Leave it for one hour at room temperature, or two in the refrigerator. Then take the fish out of the brine and place it on a small grid that fits in a steamer. Do not use a bamboo steamer unless you use that for smoking purposes only, because the bamboo will retain a smoky flavour forever. Bring water to the boil, steam the fish for about six minutes. You can either proceed with smoking at once, or let the fish cool on the grid and keep it in the refrigerator untill you need it. First you prepare the pan. 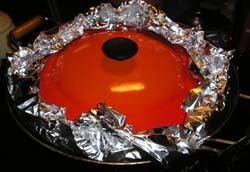 Cover the pan or wok crosswise with two layers of aluminium foil (shiny side up). Cover the lid the same way. Take care that the sheets are longer then the pan, let the excess foil hang over on the outside (the same with the cover). Sprinkle the smoking fuel on the bottom, spread evenly. Place the fish (still on on the grid on which it was steamed) in the pan, without a leaking tray. Use some small cans which have been opened at both sides to place the grid on. Place the pan/wok on a heat source, wait until smoke starts to develop. Then lower the fire and close the pan with the lid, and krinkle the foil of pan and lid together, leaving a small opening to check the smoke development (there has to be some smoke, but not an entire chimney’s worth). Seven minutes later take the pan off the fire. Leave it for another five minutes. Then open it under the working range hood or outside. Open the lid away from you. Remove the grid with the fish from the pan. Fold the alufoil into itself, and throw away (in the garbage container outside). This can be served either hot or at room temperature, with the following sauce. This sauce must be prepared in advance because it needs time to develop. Tastes also great with shrimp. Cilantro (coriander) is to the Chinese cuisine what parsley is for the French cuisine: the ‘evergreen’. Some people dislike the flavour of coriander. I was one of those once, but now I love it. Use only the leaves of the cilantro(the stems will make the sauce taste of grass). Chop the leaves finely. Add everything but the chopped cilantro leaves and the oil to the blender. Turn it on, add the oil in a thin trickle, turn the blender off. Now add the coriander leaves. Leave the sauce in the refrigerator for at least one whole night. Stir the sauce well before serving. You can keep the sauce in the refrigerator for a week at least. This sauce must be served at room temperature, so take care that you retrieve it from the refrigerator in time. Barbara Tropp, The Modern Art of Chinese Cooking: Techniques and Recipes (William Morrow Cookbooks, 1996).